The American author's exhortation, made around 150 years ago, rings truer than ever today. As populations rise, industry expands to new areas to meet rising demand, and cities sweep outward like giant, growing amoebae, land provides the surest path to salvation for rummaging investors. Twain would have been proud of Chennai's Shyam Shekhar. In 2005, Shekhar and his family - upper middle class, annual savings of close to Rs 20 lakh, investments spanning stocks, land, mutual funds - were looking to invest surplus income generated from their financial services business. Shekhar noticed agricultural land in the nondescript town of Oragadam - situated on a high plateau 50 km north-west of Chennai - going at Rs 1 lakh per acre. In nearby Sriperumbudur and Maraimalai Nagar, which had seen big-ticket investments from Hyundai Motors and Ford Motors, industrial plots were going for Rs 18 lakh and Rs 20 lakh an acre, respectively. "Farmers (in Maraimalai Nagar) were selling their uncultivable land and buying Honda motorcycles," says Shekhar. And with Oragadam attracting huge interest from the likes of Renault-Nissan, Apollo Tyres, and Delphi TVS Diesel Systems, Shekhar smelt a jackpot. The family promptly bought five acres of land for Rs 5 lakh. Today, Shekhar's investment is worth Rs 5 crore, giving an incredible compounded annualised return of 93 per cent. During this time, the entire Sriperumbudur-Oragadam belt has emerged as a big industrial hub with scores of companies setting up manufacturing base. "Two major townships are coming up within five kilometres of my land," says the 43-year-old. 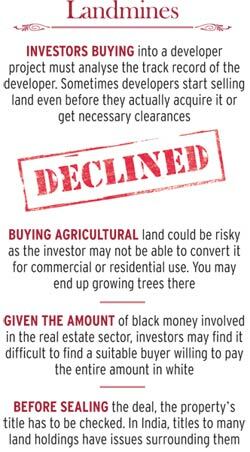 "There is a pool of investors that can consolidate land holdings and sell to developers as and when demand comes." "Historically, there is only one way land prices move, and that is up," says Ravi Ahuja, Executive Director at real estate consultancy Cushman & Wakefield India. "The low interest-rate bias, strong liquidity environment and increase in disposable income have led to a strong run-up in land prices in metros and micro markets over the past decade." Migration of skilled and unskilled people to urban centres has had favourable effects on household income, consumption and property prices in several states. Gurgaon, a laidback village till the early 1990s, today boasts the third-highest per capita income in India after Chandigarh and Mumbai. As recently as in the past four years, land prices in some parts of Gurgaon have jumped more than 100 per cent. Market experts believe GDP growth has a direct relation to the property market. If India has to grow at seven per cent plus year-on-year, more and more land would be brought under residential and commercial use. People can invest in real estate in multiple ways, but the return on land outperforms all other forms over longer investment periods. Gachibowli and Kokapet, two important IT hubs and developing commercial regions, are largely surrounded by Hyderabad city, where land prices are sky high. A 20-km stretch west of Kokapet comes under a bio-conservation zone, and Mokila is the first residential village where construction is allowed. This makes it a potential realty destination. Already, development is visible. Around 10 developers, including Sark Group, Green City Estates and Subha Gruha Projects are selling 250-350-sq yard residential plots at Rs 3,500-5,000 per sq yard. "If you look at Mokila, it's a fairly developed area with good supply of power and water," says Lakshmana Rao, a mid-level IT professional who bought a 307-sq yard plot in Mokila for Rs 14.43 lakh two months ago. "There are schools and hospitals, and a new mall is also coming up," he says. Rao adds prices across the Hyderabad region are relatively less because of the Telangana issue, and if that gets resolved, he expects to see a massive surge in prices. Located 120 km south of Ahmedabad, the port town of Dholera is the first notified SIR or special investment region in Gujarat. The 60,000-hectare area has been earmarked for industrial and commercial activities through the SIR Act, 2009. According to K.D. Chandnani, CEO of Dholera SIR Development Authority (DSIRDA), companies such as Hindustan Construction Company, Singapore-based USEL Group and Hotmail founder Sabeer Bhatia's Nano Works Developer Gujarat have shown interest in building industrial and residential projects within DSIR, and the DSIRDA has offered over 2,366 hectares to them. The area around DSIR will also experience massive development over the next few years, be it a new international airport within 30 km, an expressway connecting Dholera and Gandhinagar, or a metro rail link connecting DSIR with cities such as Ahmedabad. DSIR forms part of the second phase of the $90-billion Delhi-Mumbai Industrial Corridor project, which aims to create a dedicated rail freight corridor by 2018. While the Gujarat Infrastructure Development Board is expected to sanction the final development report submitted by DSIRDA in a couple of months, the area outside DSIR is buzzing with activity. Around 60 new residential schemes have been launched by several midsized and small developers in the past year. 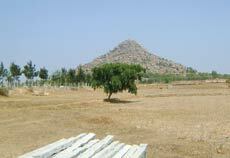 Plot sizes vary from 200 to 1,000 sq yards at Rs 1,800-3,500 per sq yard. "Projects that are closer to the SIR are going for a premium. In the past couple of months, prices have appreciated by over 65 per cent," says D.K. Patel, Director at Dholera Metro City, one of the realtors that is developing 82 plots, and claims to have sold 90 per cent of its inventory. Other developers include Magnanimous Infrastructure, Aroma Realties, and Select Realty. Located 25 km north-west of Pune, Ravet is known as the Gateway to Pune. It is also strategically placed between two major real estate market drivers - the Hinjewadi IT park and Pimpri-Chinchwad industrial belt. In the past decade, Pune city has spread out steadily to the nearby rural areas of Baner, Aundh, Wakad, Pimpri-Chinchwad and Baliwadi. Consequently, property prices in these areas have shot up. For instance, land prices in Wakad, a town 15 km north-west of Pune, are roughly 2,500-3,000 per sq ft. At Rs 1,200-1,500 per sq ft., Ravet is cheaper. Recognising future potential, several developers have acquired large land parcels in Ravet in the past two years. Although most are building apartments, investors can still buy residential plots in the vicinity. "Compared to the now staggering property prices in Pune and nearby locations, rates are lower in Ravet, and the appreciation potential is undoubtedly high," says Ashutosh Limaye, Head of Research and Real Estate Intelligence Service at Jones Lang LaSalle India. "A well-planned city, Ravet would attract many IT professionals who are looking for cheaper options but don't mind travelling a few kilometres extra." After Gujarat, Chennai, Pune and the National Capital Region, Narasapura in Kolar district of Karnataka is on course to become a major hub with many automakers planning to set up their factories in this village 52 km east of Bangalore. It is also close to Bangalore International Airport and the bustling IT suburb Whitefield. The Karnataka Industrial Areas Development Board (KIADB) has developed nearly 685 acres of industrial land. Led by Honda Motorcycle and Scooters India, Swedish truck maker Scania and Mahindra Aerospace, some 22 companies have already acquired land in Narasapura. "As soon as these units start operating, land prices are expected to go up substantially," says Ahuja of Cushman & Wakefield. Echoes R. Jithender Kumar, CEO, Paratus Buildcon, a developer that has launched two projects and has seven more in the pipeline: "We expect prices to touch Rs 900 per sq ft. by next year." Paratus Buildcon is offering 440 plots of 1,200-2,400 sq ft. at Rs 350-550 per sq ft. It is a new development corridor identified and supported by the West Bengal government. Around 2007/08, developers and companies showed interest in setting up townships and offices, but were held back by infrastructure and wetland issues. But now the area is developing fast. The government's nodal agency, West Bengal Housing Infrastructure Development Corporation (WBHIDCO), is sprucing up civil infrastructure with a strong focus on electricity connections, public transport and sewage system. The Rs 4,874-crore East-West Metro Project, which will connect Rajarhat New Town to Kolkata, is slated to open by 2014. 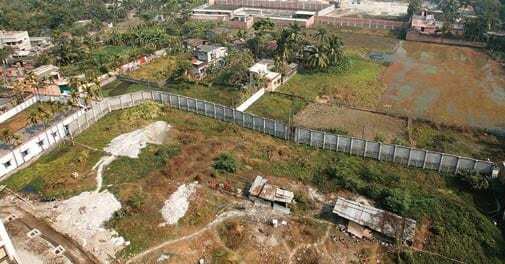 "Previously over-hyped, Rajarhat New Town maintains long-term potential because of infrastructure developments, and the fact that it is close to the airport and is on the IT corridor," says Limaye. Nearly 50 small and big developers are building housing projects in the New Town area. Besides, some 10-odd developers, including Mandira Developers, Keventer Group and Unnayan Developers, in and around New Town, are offering residential plots at prices between Rs 12 lakh and Rs 15 lakh per 750 sq ft. Then, there is WBHIDCO allotted residential land, which can be purchased directly from individuals. "People who are looking for quality space at affordable prices are shifting here," says Sujoy Saha, MD of real estate broking firm Grihalay Marketing. Incidentally, in a curious irony, Mark Twain went bankrupt later in life - because of his investments in technology. Not land.